Eco Caminhos is an eco farm in Brazil, situated in the beautiful mountains of Nova Fribugo, where we work with bioconstruction, organic farming, and permaculture. We offer volunteers the chance to become a part of our project and live in our international community, while enjoying nature and ecotourism activities. 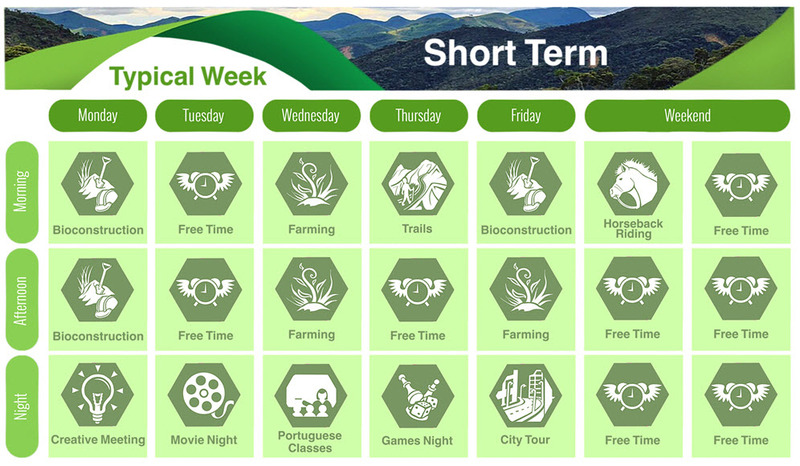 Short-term volunteering at Eco Caminhos is an excellent way to gain practical skills and experience in eco-farming, bioconstruction, and permaculture. At our eco farm, you will live and work with people from around the world. Living in a rustic setting, you will have the opportunity to make lifelong friends while learning the Portuguese language. The short-term programme is ideal for people who have limited time for a long-term immersion or lack the skills to join our long-term programme from the start. In case you do well, you could be invited for the long-term (free) programme. What will your average day look like? Short-term volunteers will work approximately 24 hours 3 days a week. Tuesdays and Thursdays are off. Volunteers can choose between bioconstruction and organic farming. After your work day and on your weekends, you are free to do as you please. Many of our volunteers use their weekends to explore Nova Friburgo or Rio de Janeiro. Once a week the people of Eco Caminhos unite in the evening to socialize. During these volunteer nights we usually cook together or make a fire outside, but all suggestions are welcome. What matters is that we spend time together. To guarantee your safe and comfortable arrival our trusted driver from Nova Friburgo, Patrique, can pick you and leave you at the Eco Caminhos doorstep. He will wait for you in the arrival hall with a small name plate. Patrique charges only R$ 400 (approximately € 100 ), which is a very sharp price for Brazil. We can also arrange for you to be dropped off at a specific location on your day of departure. * Our prices are in Brazilian Real and are exclusive of tax. The prices in US$ and Euros are indicative and the exact amount in US$ or Euro will be calculated on the day of booking. Participate in volunteer nights, including board games, cinema, and campfires.